This is an English locational surname. It is believed to originate from either the village known as Wolfhole Crag in Lancashire, or possibly the lost village of Wolfall, also in the county of Lancashire. There is a possibility that some later nameholders may originate from the similarly named Wolf Hall, near Grafton, in the county of Wiltshire. The place name, and hence the later surname, may translate as the place (halh) where wolves were found, and this would seem to apply to Wolfhole Crag, but it is more likely that for other places the referrence is to a person called "Wolf". This was a popular Anglo-Saxon baptismal name, and a later surname in its own right. As regards the possibility that some nameholders derive from a lost village, it is known that over 5% of all British and Irish locational surnames do originate from lost or obliterated sites, so whilst unusual, this is by no means an uncommon phenomena. The surname is first recorded in Lancashire in the year 1242, when John de la Wulfhal appears in the tax rolls known as the "Feet of Fines", and about a century later Robert de Wolfalle in the Subsidy Rolls, also of Lancashire, in 1332. Locational surnames are usually 'from' names. That is to say names given to people as easy identification by their new neighbours. 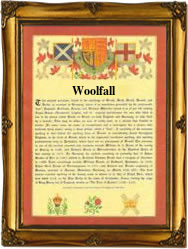 However in this case it is probable that for the majority of nameholders, the descent is from the original lords of the manor of Wolfhole or Wolfall in Lancashire.